Based on the Burgundy Master windowblind by Lightstar. Includes Clock, Media, Drive Meter, CPU Meter, Recycler, and more tools. CTRL click and drag the speakers to move them independently of the main player. Scripts by Skarn, sViz, rabidrobot, and martin. Wall in screenshot is by Sed. Expressable! Nice piece of work, RND! I believe it's been a while since we were last treated to your Desktop Gadgets / Widgets. It seems you haven't lost your touch. Beautiful work on all Jim. Thanks Reaper, Dave, Don, and Ace! It's good to do something again! Yes, you did! And a stunning beauty it is!! Your'e worth every nice comment you get, you do wonderful work. Thanks for contributing.This is awesome. 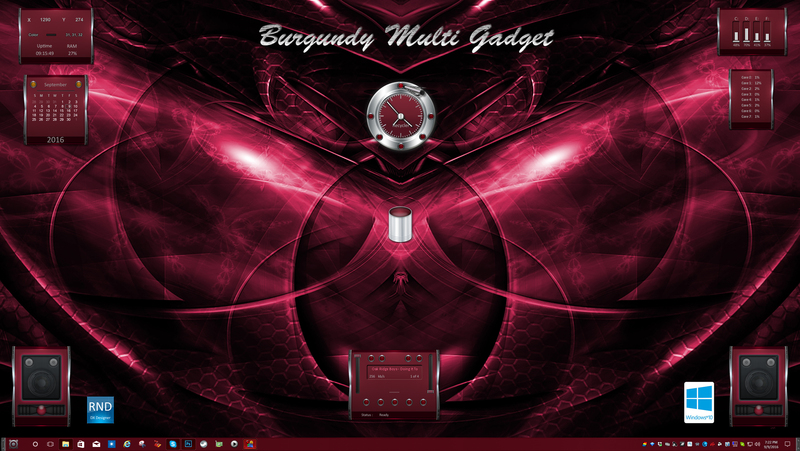 Beautiful gadget... and works perfectly on Windows 10 !! I was desperate because my favourite gadgets still work on Win7, but stopped working on Win10 : Titan's Forge Clock, Hal 2030 Clock,Wood'n Chrome Clock , and a few others. Strangely enough, it's only the clock gadgets that stopped working, the full gadgets or weather gadgets still work ! And Metropolis Clock Gadget stopped working both on Win7 and Win10 ! This is a mystery to me !! Anyway, thanks again for this great gadget... you're the king of desktop gadgets ! I see here: 2154... unbelievable !! This burgundy color really looks awesome and to have a theme like this is very good. I am so amazed to get this skin to my pc. As i always work with ivory research discount blogs and would love to get them here to my system. This burgundy shade simply seems first rate and to have a subject like that is very good. i'm so surprised to get this skin to my computer. As i always work with essay writing help blogs and would really like to get them right here to my machine.